One new restaurant. One new bar. Lots of homemade cheetos from a Top Chef. 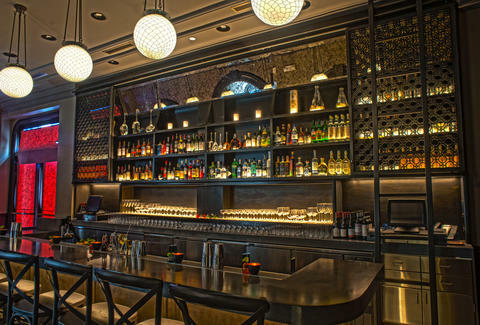 From a Top Chef competitor and a drinksmith formerly behind the program at Beretta comes two glorious spots in one: Aveline (an amazing restaurant), and immediately next to it, The European (a complementary bar). So, what to expect? 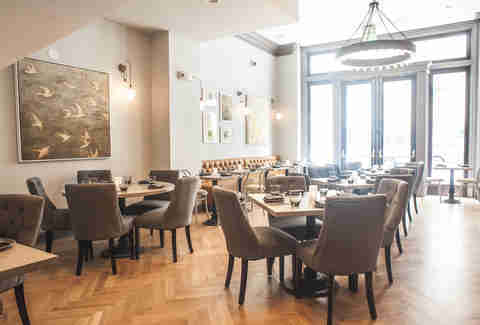 The Aveline: The main restaurant space has a bright, airy interior along with glass-enclosed wine rack walls and a large open kitchen, which will be producing "New Californian" cuisine all influenced by Chef Casey Thompson's roots in French and Southern cooking. The European: Influenced by bar manager Adam Wilson's experiences across six (!) different continents, the cocktails will be an updated take on Prohibition-era drinks designed to pair beautifully with the bar menu (put together from some of Casey Thompson's favorite snacks). Which, lucky for you, we've created a handy guide to! What to get: "Chips 'n Dip" that're actually way better than mere chips 'n dip. They're crispy-fried chicken skins with charred onion, smoked eggplant cream, and trout roe. Pair with: Since these have flavor that packs a punch, pair it with an Aperol Kick with gin, sparkling wine, and seltzer. 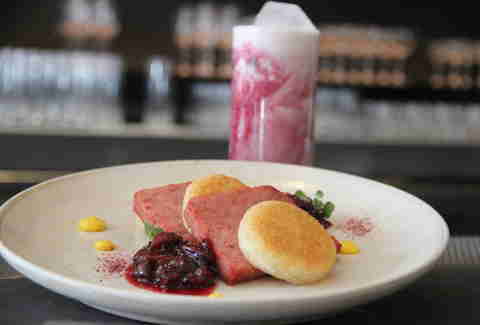 What to get: The house-made "SPAM" that's actually way better than Spam (seriously guys, quit lowering our expectations) and is, in fact, incredible cured pork shoulder with Texas toast-ettes, homemade mustard, and black grape jelly. 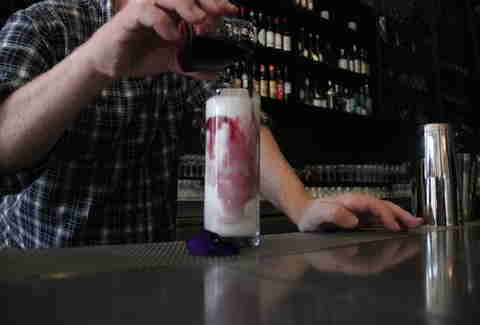 Pair with: The Violet Fizz, a combo of gin, cream, and seltzer with a black currant and violette mixture poured over. 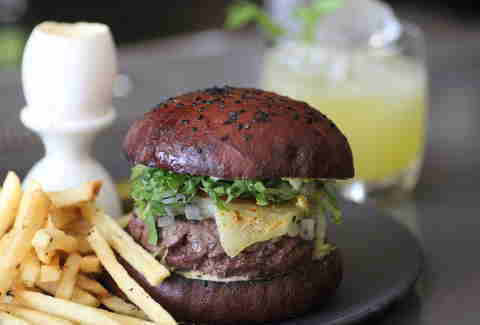 What to get: The Brisket Burger is served with vidalia onion, Fontina, and Vegemite butter, and -- hyperbole aside -- may just be in contention for SF's best burger. 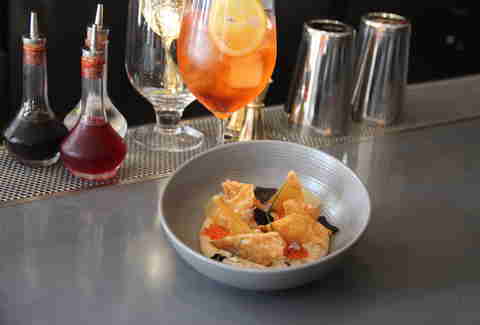 Pair with: The Sauternes Punch with lemon, orange, celery, and white pepper. 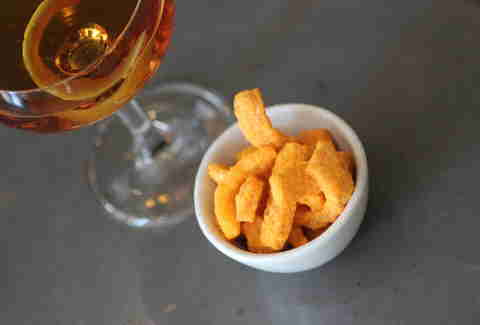 What to get: The pièce de résistance -- an upscale take on the chef's favorite snack, house-made cheetos. You really, really need to try these. Pair with: The Duke, since a classy snack deserves a classy cocktail, this combo of Campari, rye, vermouth, and absinthe is perfect. Joe Starkey is Thrillist's San Francisco Editor and can't wait for someone to take on his favorite pairing of Goldfish Crackers and diet Pepsi. Don't judge him. But do follow him on Twitter.